Life is slowly returning to normal. We still have not unpacked and are having to find our way around tools and saw dust, but lots has happened. In the Bathroom we re-tiled over the 1970's green tile. We can't afford to replace the Harvest Gold Bathtub or "rose print" tiles quite yet, so we tried to think of a colour scheme that will work. 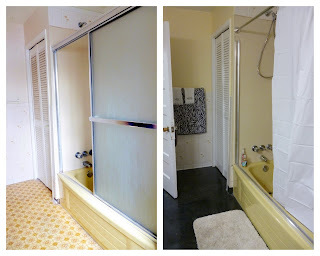 We chose black stick tiles, and a sunny yellow for the walls. We are now on the search for some white, grey and yellow fabric for a shower curtain. This weekend we are going to try removing the rest of the tracking for the shower doors. Last night we replaced the fittings for the tub hot and cold handles and the spout. Dan sprayed water everywhere, a traditional plumbing initiation practice in these parts. 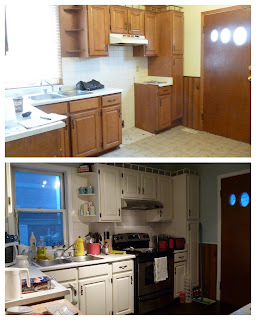 We painted our cupboards and laid laminate floor down over the old tile floor in the kitchen and foyer. First we put up jack posts in the basement to support the staircase which has a serious slope. Everything got painted, cleaned, and we got our appliances. Looks like a very messy, but very fancy kitchen now. I can hardly believe I'm still allowed to live here! We kept some of the quirky things, like the funny railing along the top of the cupboards and the wood panelling on the walls. My dad and my uncle have rewired part of our basement and much of our main floor. We knew the house had some knob and tube wiring, but we didn't realize how poorly the house was wired... so I feel much safer now. 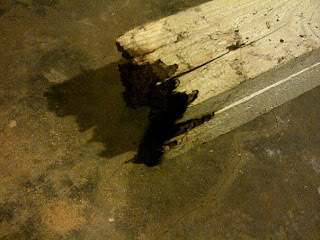 This lovely, rotted old piece of wood was what was supposed to be supporting our stair case. It's no wonder the stairs were a little slanty... and bouncy! Our washer and dryer are coming on Saturday, which is great because I am starting to smell bad. We are going to hopefully be picking up a few more pieces of furniture on Sunday at an auction sale, and at that point, we will really be ready to unpack and get back to normal... Which I am very much looking forward to. My house also came with a Harvest gold bathtub, one thing I did was make a shower curtain that comes down to the floor, so you can,t see the yellow. I love the changes you've made, what a lovely home! It's great to have the floor jacked up and wiring made safe, too!